With the calendar set to flip to February, the Gators finally played the type of game that they’ll need to play in March. And surprise, surprise — they won that game. 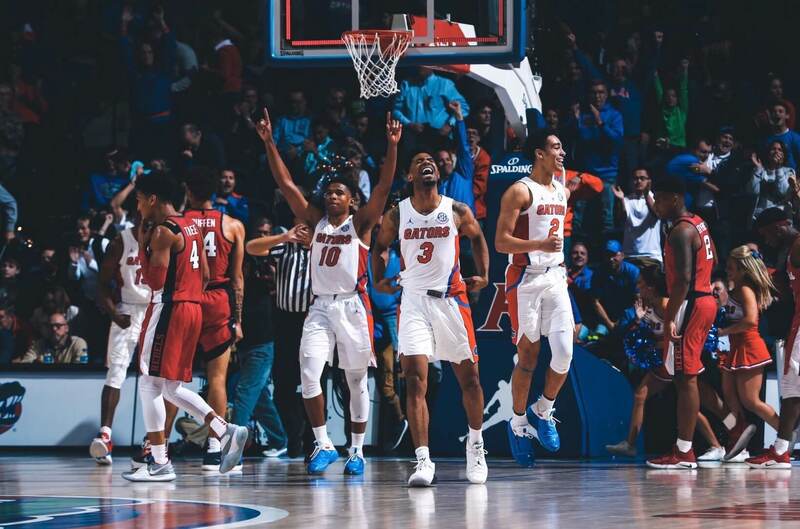 Thanks to some heroics from a resurgent KeVaughn Allen, six threes from freshman Noah Locke and just enough defense, Florida fought off a modestly talented but resilient Mississippi squad, 90-86, in overtime. The victory is by far the most impressive from a resume standpoint that the Gators have earned this year, and now it appears that Mike White’s team has a legitimate path to the Big Dance that doesn’t include winning the SEC Tournament. Florida led 33-30 at the break thanks to a late offensive spurt highlighted by a rare Jalen Hudson drive from the corner, and started the second half even better. The Gators’ lead ballooned to 49-42 on a pair of impressive back to back plays from Keyontae Johnson. First, he caught an inbounds pass midflight and slammed it down for a free two points, and on the very next trip down, banked in a contested layup. But then Mississippi launched an 11-0 run to retake the lead, and thus began a wild back and forth final ten minutes during which neither team led by more than five. Those final ten minutes wound up being overshadowed by a few key plays down the stretch, but they should not be forgotten about due to the sheer excitement they provided. So below, I’ve provided a quick synopsis of the seesaw of lead changes. Take a deep breath before proceeding. With 9:10 to go, Noah Locke tied the game up at 57 with a three, the teams traded a pair of free throws, Terence Davis hit a jumper to put the Rebels in front, Locke gave Florida the lead back with another three, Devontae Shuler returned the lead to the Rebels’ hands with a layup, Kevarrius Hayes came through with a pair of free throws to make it 64-63 Florida, Breein Tyree put Ole Miss up 66-64 with a three, Shuler doubled the margin to four with a layup, Allen sank a pair of free throws to cut the deficit back down to two, Dominik Olejniczak banked in a layup to make it four again, Allen responded with a jumper to draw the Gators within two again, and then Locke buried another three to stake Florida a 71-70 lead with under two minutes to go. And I got to write a few words about nearly every possession for both teams over an eight minute stretch because for the first time all year, Florida participated in a game that required it. The Gators didn’t play a perfect game of basketball by any means, but they played a tough game of basketball, and so regardless of the end result, there were going to be positives to take away from it. As the clock neared zero, though, the end result did not look especially promising. Terence Davis promptly put the Rebels back on top with a jumper, and following an Allen miss, KJ Buffen hit a pair of free throws to make it 74-71 with 61 seconds remaining. Andrew Nembhard closed the gap to one with a midrange jumper of his own, and then the Gators appeared to have a chance to go for the win when Tyree missed a wild layup. But Davis managed to fight off three Gators for the rebound to force a tie up and the possession arrow favored Mississippi. Forced to foul Tyree, the Gators could only watch as a one point deficit became three with :8.8 remaining. Then Allen became the hero Florida fans have been waiting for him to be for three a half years. And unlike against South Carolina, Florida defended the Rebels’ Hail Mary inbounds pass this time to force an additional five minutes of basketball. Buoyed by Allen’s Messianic heroism, the Gators jumped all over the Rebels in overtime. Locke drained a three right off the tip, Allen followed up his three with back to back jumpers and then Nembhard knocked down another three to put Florida up 86-79 midway through the overtime. From there, the undersized Gators held on, overcoming a nearly catastrophic turnover from Allen when Locke drained two more free throws with eleven seconds left to provide the final 90-86 margin. Do not for a moment mistake this win for the solution to all the Gators’ problems. Florida was killed on the boards again (Ole Miss outrebounded Florida 41-27) due to its collective lack of size and turned it over 13 times. But this win also highlighted the presence of the type of grit that could win some of the even bigger games on the horizon- a grit that cannot be done justice with mere words, so I’ll eschew an attempt to do so and simply show you. And for a seemingly limited team representing an athletic program that sets no limits, plays like that just might be what breaks through the ceiling.